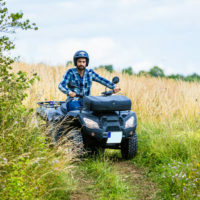 After riding an ATV on the highway in Arlington County, a Washington D.C. resident faces reckless driving and other charges in Virginia, according to an article by The Washington Post. Back in April, 24-year-old Stephon Williams was part of a large pack of ATVs and dirt bikes riding on Arlington Boulevard. A police officer was responding to a separate incident nearby and observed the group of ATVs and dirt bikes. The officer maintained pursuit and surveillance until the group left Arlington County. Armed with a description, D.C. police were able to track down Williams and make an arrest. Williams’ extradition to Virginia is forthcoming. In light of this news story, it feels like a great time to review the basics of reckless driving laws in Virginia. In Code of Virginia section 46.2-852, we find a general definition for reckless driving. There are essentially two elements to this crime. First, a person must be driving on the highway for reckless driving to apply. Second, reckless driving requires a person to drive “in a manner so as to endanger the life, limb, or property of any person.” Stated otherwise, if a person drives on the highway and their actions put other people or property in danger, then that person has committed reckless driving. There are two specific regulations concerning speed limits outlined in Code of Virginia section 46.2-862. First, if a person exceeds the speed limit by more than 20 miles per hour, then that person is guilty of reckless driving. Second, if a person drives more than 80 miles per hour, then that person is guilty of reckless driving. Turning to Code of Virginia section 46.2-868, we have a breakdown of the penalties for reckless driving. At a minimum, reckless driving is a Class 1 misdemeanor. If a person commits reckless driving while using a cell phone or similar device, then that person will face an additional fine of at least $250. If a person does not have a valid driver’s license and kills someone as a result of reckless driving, then it is a Class 6 felony. Now that we have covered the basics, it is important to note that there many other facets of reckless driving. If you are curious and want to learn more about Virginia’s laws concerning reckless driving, please feel free to check out this overview guide we created for our website. Any time criminal charges are involved, there is a lot at stake. A dedicated and experienced criminal defense attorney might be the only barrier between your liberty and a lengthy sentence. That is why it is so important to seek out legal counsel as early as possible, ensuring that you have someone to fight for you in court. If you are facing charges for any criminal offense, Simms Showers LLP is here to help. Located in Leesburg, Simms Showers LLP represents clients all over Virginia. Our attorneys are available by submitting a quick online form or by calling 703-997-7821.